Death mask of Field Marshal Erwin Rommel, discovered by U.S. Seventh Army troops in 1945. A death mask is a mold taken from a person’s face after they have died. Death masks may be mementos of the dead, or be used for creation of portraits. 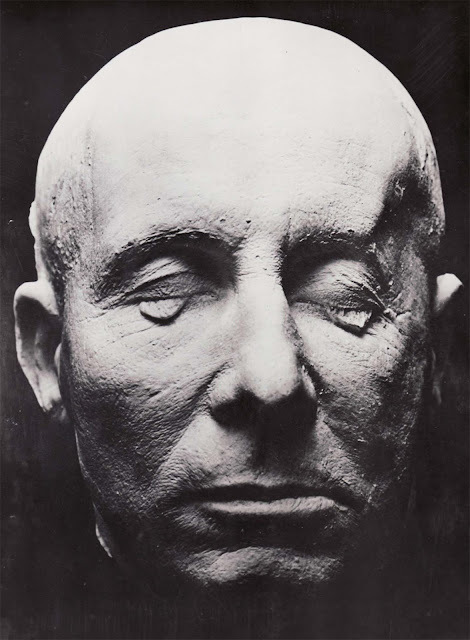 Wounded in France three months before his death, Rommel’s death mask shows evidence of the injuries, particularly the indentation of the left temple. The “tears” under his eyes are air bubbles trapped in his eyelids when the cast was taken off. Some observers have commented on the Field Marshal’s expression of fatigue, resignation and despair. His son Manfred regarded the expression as one of contempt. Rommel was connected with the July 20th plot to kill Hitler, though he did not advocate killing Hitler, he was in support of overthrowing the Nazi regime and installing a government which would make a peace settlement with the allies. After the failure of the plot, the Nazi regime gave him two options. He would either face the People’s Court—which would have been tantamount to a death sentence—or choose a quiet suicide. In the former case, his family would have suffered even before the all-but-certain conviction and execution, and his staff would have been arrested and executed as well. In the latter case, the government would claim that he died a hero and bury him with full military honors, and his family would receive full pension payments. On 14 October 1944, General Wilhelm Burgdorf, with General Ernst Maisel, arrived at the Rommel household. Burgdorf had been instructed by Field Marshal Wilhelm Keitel to offer Rommel a choice – take poison, receive a state funeral, and obtain immunity for his family and staff, or face a trial for treason. As Rommel thought the matter over, an SS detachment surrounded his village, leading him to conclude that if he agreed to face the People’s Court, he would not reach Berlin alive. With that in mind, Rommel opted to commit suicide, and explained his decision to his wife and son. Wearing his Afrika Korps jacket and carrying his field marshal’s baton, Rommel went to General Wilhelm Burgdorf’s Opel, driven by SS Master Sergeant Heinrich Doose, and was driven out of the village. After stopping, Doose and Maisel walked away from the car, leaving Rommel with Burgdorf. Five minutes later Burgdorf gestured to the two men to return to the car, and Doose noticed that Rommel was slumped over, having taken the cyanide pill. Ten minutes later the group telephoned Rommel’s wife to inform her of Rommel’s death. The official story of Rommel’s death, as reported to the public, stated that Rommel had died of either a heart attack or a cerebral embolism—a complication of the skull fractures he had suffered in the earlier strafing of his staff car. To further strengthen the story, Hitler ordered an official day of mourning in commemoration. As previously promised, Rommel was given a state funeral. Rommel had specified that no political paraphernalia be displayed on his corpse, but the Nazis made sure his coffin was festooned with swastikas. The truth behind Rommel’s death became known to the Allies when intelligence officer Charles Marshall interviewed Rommel’s widow, Lucia Rommel, as well as from a letter by Rommel’s son Manfred in April 1945.